South Korean press has reported recently that North Korea is preparing to conduct another nuclear explosive test at the same site as its 2006 and 2009 tests. These reports cite recent satellite imagery showing an increase in the amount of dirt adjacent to a test shaft. ISIS has obtained commercial satellite imagery taken on April 1, 2012. This new imagery shows what appears to be an increase in the size of a pile of material at the test site (see figures 1 and 2), though it is unclear if such an increase is necessarily evidence of an impending nuclear test. p> In 2010, satellite imagery showed evidence of excavation work in the form of a growing pile of earth or other material at the site and led to speculation that a test could follow. However, a test did not occur. This same pile of material is now growing again, as seen in the April 1, 2012 imagery. A recent report from South Korean intelligence reportedly assesses that the “…dirt believed to have been brought from other areas is piled at the tunnel entrance…” It assesses that this dirt would be used to “plug” the tunnel before conducting a test. In other words, South Korean intelligence reportedly assesses that the growth in the pile of material seen in the newest satellite imagery is not evidence of tunneling activity for a test shaft but rather evidence of bringing in material from elsewhere. According to these reports, North Korea would use this material to plug a shaft in advance of a nuclear explosive test, which by implication could happen soon. However, it is possible that the increase in material seen in the April 1, 2012 image is resulting from further excavation of a test shaft, and not evidence of an intention to plug the shaft before a test. Moreover, even if the South Korean report is correct, the test may not be imminent. p> ISIS will continue to collect and assess satellite imagery of the test site. Figure 1. 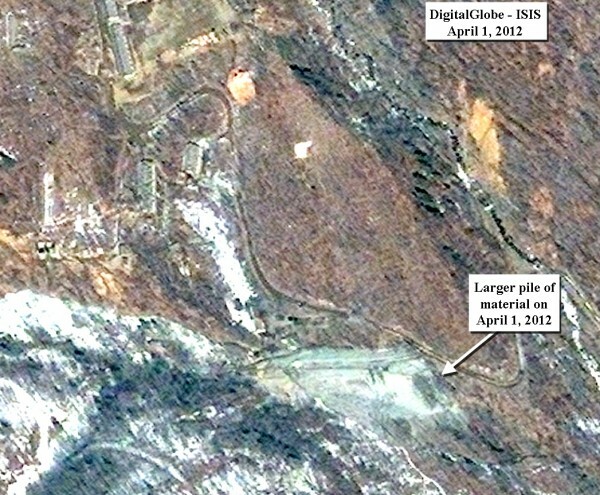 An April 1, 2012 commercial satellite image of the nuclear test site in North Korea. 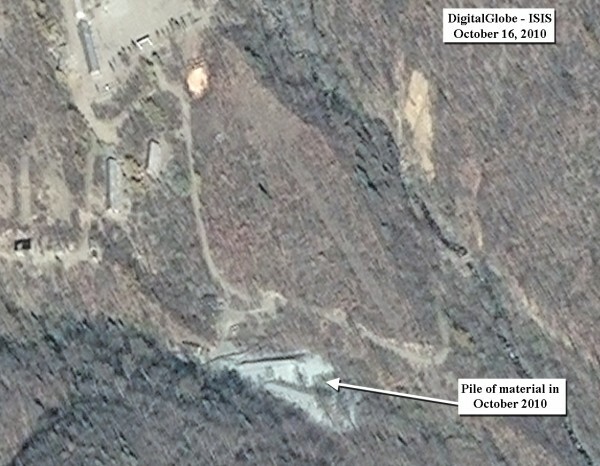 A pile of material adjacent to a reported test shaft entrance appears to have grown, compared to an October 16, 2010 satellite image of the same site. It is not clear, however, if this is necessarily evidence of an impending nuclear explosive test. Figure 2. An October 16, 2010 commercial satellite image of the same site. The pile of material appears smaller in this image.